The 5 levels of health is a model which organizes health and healing into the physical body, energy body, mental body, information body and consciousness. The idea of 5 levels of health is not new. There are many ancient references to the idea that we are more than our physical body. The work I do is a contemporary application of these ancient principles coupled with the usefulness of modern technology and clinical application. I was introduced to this model through the work of my mentor, Dietrich Klinghardt, M.D, Phd. www.KlinghardtAcademy.com The Taittiriya Upanishad describes five bodies or sheaths called koshas that “cover” or contain our higher consciousness. The koshas constitute layers, or veils, that operate at different levels, always circling ever outward from the inner self. 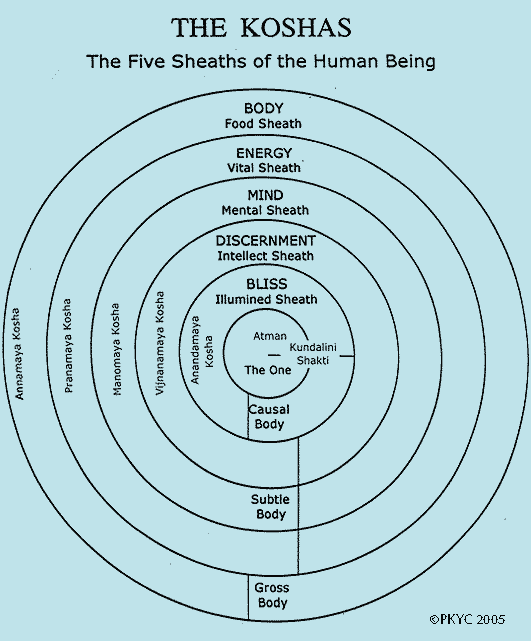 These five layers or sheaths of consciousness are usually depicted as originating with the most material kosha and transcending to the most ethereal. An alternative view is that the koshas emerge from the highest vibratory or spiritual state, or the blissful level, and then shift toward the most material level. While the energies shift from subtle to material, the material then climbs again to subtle. Thus, the koshas can be viewed as constantly operating on both a microcosmic and macrocosmic level. In our model, the 5 levels also shift one to the other, interdependent, each influencing the other. You might say we began as “consciousness” or spirit and was then birthed into the physical only to return to consciousness. Others believe we began as physical and are meant to return to the spiritual. (spirit.) It’s safe to say….no one knows for sure. There are many mysteries yet to be fully understood on each of these levels. For me, that is part of the wonder. This entry was posted in blog and tagged 5 Levels of Health & Healing, autoimmune, Autonomic Response Testing, Chiropractor, Dietrich Klinghardt, Functional Medicine, MCIDS, PEMF Pulsed electromagnetic field therapy, Quantum Health, raindrop therapy, toxins. Bookmark the permalink. ← How can you stay healthy through this model? 3 Responses to What are the 5 levels of health & healing? Admiring the hard work you put into your site and detailed information you provide. It’s good to come across a blog every once in a while that isn’t the same unwanted rehashed information. Excellent read! I’ve bookmarked your site and I’m including your RSS feeds to my Google account. I don’t remember a lot the way i got right here, but boy oh yeah boy I really did not need to hesitate and read a few of your entries, they are just fine works of writing and very much great opinions on pretty much this hard subject. Rock and roll on my good friend.